BMW decided to rationalise its model lines in the early 2010s, using odd numbers for hatchbacks, saloons and estates (1 Series, 3 Series, 5 Series and 7 Series), and then using the sequential even number to denote the more attractive, desirable coupe, Gran Coupe (four-door coupe) and convertible models of the same vehicles – so the 2 Series is related to the 1 Series, the 4 Series to the 3 Series and so on. 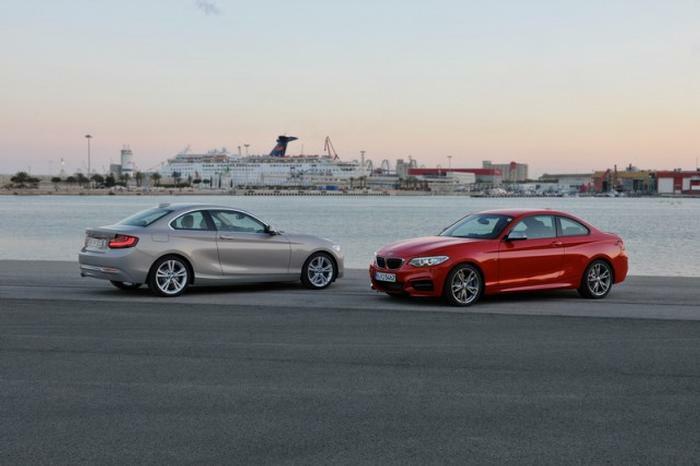 Thus, in 2014 the 2 Series Coupe was born: it was a successor to the old 1 Series Coupe, which had been on sale since 2007 and was based on the first-generation 1 Series hatchback, whereas the 2 Series Coupe was based on the second-generation 1 Series hatchback. Although the 2 Series badge is used on a Convertible model, as well as two mini-MPVs (the Active and Gran Tourer variants), it is specifically the Coupe we are focusing on here. There’s a huge array of entirely turbocharged petrol and diesel engines available for the two-door-only 2 Series Coupe, with either three, four or six cylinders. Gearboxes used throughout the car’s production life include a six-speed manual, an eight-speed automatic and then, later in the model cycle, a seven-speed dual-clutch transmission (DCT) on selected models. BMW did make four-wheel drive available on several variants, including one of the high-performance models, but sometimes this was only for left-hand-drive cars and so it’s a much less common feature on right-hand-drive Twos (it’s limited to pretty much the higher-power diesels) – most used examples will be rear-wheel drive. The 2 Series Coupe was facelifted in 2017 with what BMW calls a life-cycle impulse (LCI), which tweaked the looks and interior, and also brought about some motive-power changes that we’ll run through below. For diesel fans, the choice is just one 2.0-litre, four-cylinder unit, which originally came with either one or two turbos. In single-turbo guise, it delivered 143hp (2014-2015) and then 150hp (2015-on) as the 218d, or 184hp (2014-2015) and then 190hp (2015-on) as the 220d. As a biturbo, it was badged 225d and made 218hp until 2015, when it was replaced with a single-turbo iteration of the same four-cylinder diesel, now delivering a healthy 224hp. Moving over to the petrol options, an interesting engine was found in the 218i, introduced in 2015. It’s a 1.5-litre, three-cylinder unit delivering 136hp/220Nm and it’s basically the same engine as in the MINI Cooper. Other regular petrol choices run 220i, 228i and 230i, but – despite the impressive badge numbers – all of these were four-cylinder engines. They make either 184hp (220i) or 245hp (228i), with the 230i being a direct replacement for the 228i in 2016; the 230i has 252hp. But the 2 Series has four high-performance derivatives to get excited about, if you’re in the used-car market. All of them used 3.0-litre, six-cylinder, turbocharged petrol engines. The first was the M235i, launched in 2014 with a 326hp motor. This evolved into the M240i as part of the LCI, where its power output went up to 340hp – and the M240i is one of the truly great, modern-day performance cars, so it makes an incredibly appealing second-hand buy. However, the 2 Series went even further with the M2. This first launched in 2015 and used a highly-evolved derivation of the M235i’s straight-six engine, giving it 370hp, a 0-100km/h time of 4.3 seconds (with M DCT) and a limited top speed of 250km/h. Yet there was still room for more performance from the 2 Series, as the M2 was replaced by the focused M2 Competition in 2018. Emissions regs meant the old 370hp unit could not be adapted at reasonable cost, so BMW simply borrowed the twin-turbo, 3.0 straight-six from the M3/M4 models and placed it into the M2 Competition. With 410hp and 550Nm, the M2 Competition is a ferocious performance car and it might also be a future classic, with appreciating second-hand values, so find a good used one now while you can. Although the M2 Competition seems the obvious choice, it’s also a very expensive and relatively rare machine, especially on the used-car market. But while it might seem sensible to go for one from the regular line-up instead, we think the M235i and M240i offer an incredible ownership proposition for used buyers. As the M240i is a newer vehicle, the M235i seems to be where the smart money is. The BMW 2 Series is a superb everyday performance car, because it preserves as much of the 1 Series hatchback source material’s practicality as it can in its two-door body, while simultaneously offering something more exciting to drive than its sibling. There’s plenty of choice with the 2 Series on the used market, but definitely seek out one of the versions with an ‘M’ on its rump – they’re fantastic machines.